I started reading this book online at the HarperCollins website. They have a new feature called "Browse Inside" where you can read the opening chapters of many of their books. Generally they will have the full text of up to two books available each month. You might have to become a member to enable viewing of the full text. I have been interested in virtual books for a few years, but have been sceptical of how the screen would look, would the print be large enough and a clear fonnt, could you add bookmarks etc. Since I was reading on my desktop the screen was amply large and the text was wonderfully big and clear. I preferred to scroll down the page rather than selecting 'next'. The next page took longer to load, but when scrolling it starts to load when you are still reading the current page. Will have to check on the bookmarks. Reading this 400+ page book at my desk would not be comfy so I bought a copy of the book the other day. Though, if I had a laptop, I would have moved to the sofa and kept going. Click the "Browse Inside" link to the left to give it a try. 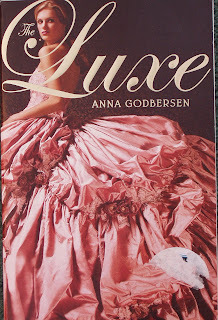 "The Luxe" will be posted until February 10. Thanks for letting us know about this site. I will have to check it out. I can't imagine reading a whole book on the computer screen, but I might be interested in a chapter or two just to see if I want to get the book.